the actual plastic of the drum that the seal fits into so am now worried that if I do manage to remove and replace the heater it may leak. I accept that I may have to pay someone to repair it (if it's possible to repair) but don't want to pay someone to tell me it's a write off. The machine is only 15 months old. Can someone tell me my options please? Have I ruined the drum? Can the heater be removed? Many thanks again for any replies. Hello Dan. This has happened because you removed the nut on the heater. 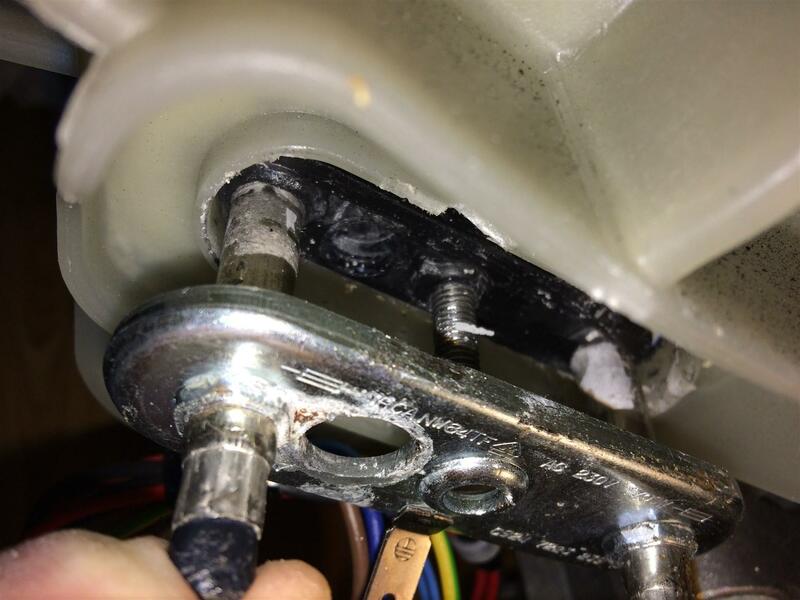 To remove a heating element you loosen the nut and screw it up to the top of the thread and then knock it and it's thread shaft down so the nut is flush with the heater plate. This then releases the tension on the rubber and allows the element to come out. Even then it can be tricky. You are right in worrying about the damage to the plastic surround on the tub possibly causing a leak. However, looking at it I'm hopeful that it won't. But if you successfully sort it you would need to check that properly before putting the back panel back on. If it did leak you'd need to thoroughly dry it and use suitable sealant. To remove the heater you need to remove the rubber. That's what's holding it there. Try using narrow nosed pliers to pull bits of it forward and try using small bladed medium sized screwdriver. Essentially you have to pick away at it and pull the rubber to this side of the opening. Another method would be to hacksaw off the element but I would be very cautions about that. The element contains insulation in powdered form. I don't know what it is. If it is asbestos that's a serious health risk. Having said all that I do recall that sometimes a heater just won't come out because the rubber has become so squashed and bulbous. In the old days it wasn't a problem because you just used a big screwdriver and levered it out bit by bit. That was when the slot for the heater was always made of metal. These days, as you have found, using leverage to prise the element out only damages the plastic surround. So if you have a difficult one that needs a lot of leverage, the only way to get it out is to remove the nut completely and pull it clear of the rubber as you have done. Then you have to try to do as I said in my first reply. Just try to coax the rubber out with narrow nosed pliers, small and medium flat bladed screwdrivers. Even cut parts away if necessary - but don't let any rubber fall inside the machine. It can be tricky, and time-consuming but it can be done. Many thanks for the advice. I'll give it a go. Let us know how you get on. I've linked to this topic in my article now as it might be helpful to others in the future.